In the fourth week unbeaten champions Ospreys took on Cardiff Blues - the only other unbeaten team – in the championship decider. 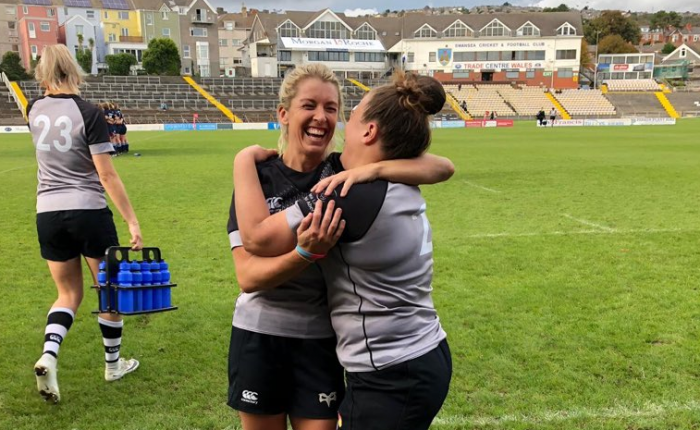 Ospreys had the benefit of home advantage for the second weekend with Cardiff travelling to St Helen’s for the much-anticipated title decider, but instead of the close game expected it was a dominant display from the hosts. Ospreys set the tone of the match early on. The power of the Ospreys’ pack was soon evident with Cardiff Blues struggling to hold them back. Penalties stacked up and Ospreys soon took advantage, a quick tap and go from Keira Bevan set the pack up nicely and a drive over the line from Amy Evans opened the score. No conversion, but the Ospreys were 5-0 ahead. From the restart, the Ospreys took the control and the Blues were forced to defend against a relentless Ospreys attack. Securing a lineout just inside the Blues 22, a driving maul from the pack set Natalia John up nicely for the second try of the game. Keira Bevan with the conversion extended the lead 12-0. Cardiff Blues were dealt another blow just before half time, with Lily Snape receiving a yellow card. The Ospreys continued to dominate and took advantage of the extra player. With Cardiff stretched Ffion Bowen added the third try of the game just before halftime. No conversion, but the Ospreys went in at the break with a 17-0 lead. In the second half Ospreys continued their dominance. A quick break from Robyn Lock drew the defence making room for Lauren Smyth to break her way through for the bonus point try. The conversion bouncing off the posts put the score at 22-0. With all of the play now at the Cardiff end, quick line speed from Smyth and an offload to her wing sent Emma Hennessy over the line for the Osprey’s fifth of the game. Keira Bevan with the conversion extended the Ospreys lead to 29-0 with 20 minutes left. Cardiff were defending bravely, but a build-up of phases eventually saw Ffion Bowen blitz her way over the line for her second score. No conversion put the score at 34-0. Cardiff endeavoured to go on the offensive but a break from Alecs Donovan took the game back into the Blues 22. Strong support saw Siwan Lillicrap burst through the defence for the final try of the game under the posts. Bevan having the final say with the conversion, giving Ospreys a 41-0 win. In the other fixture Dragons travel north to take on RGC, both teams without a win. The home side dominated territory at the start with forwards Gwenllian Pyrs and Teleri Davies driving at the heart of the Dragon defence and scrum half Sioned Williams distributing well. Jess Kavanagh on the wing also looked sharp from the off. But the Dragons defended well, and once on the offensive. A driving maul following a lineout fed the ball to Cerys Hale who powered over to open the scoring after fifteen minutes. RGC drew level ten minutes later. a quickly taken tap penalty causing a little confusion in the Dragon's defence. Quick hands gave Jess Kavanagh space and her pace took her clear to score out wide. Bethan Davies’ conversion put RGC ahead. For much of the remainder of the first half was an untidy affair with a high penalty count preventing much needed continuity, defences in charge and solid tackling by the likes of Emma Edwards a feature. The second half opened successfully for the home side when a wicked bounce fell kindly for Jess Kavanagh to sprint away and score her second. Beth Davies again added the extras for a 14-5 lead, and soon afterwards she charged out of defence to set up a phase that ended when Kavanagh once again crossed the line for her hat trick. Dragons kept pressing with centre Beth Wakefield to the fore but it was RGC who scored again when Beth Davies intercepted on the halfway line and scored under the posts. 26-5. RGC were now well on top and chip ahead caused confusion for Dragons. Molly Shuttleworth collected sweetly and offloaded to supporting Hannah Hughes to score, Davies again at hand to add the conversion. With the benches being emptied in the final twenty minutes Dragons fortune changed. First Bethan Lewis to squeezed in at the corner and then Jade Knight ended afternoon's scoring with a final score of 33-17 for the North Walians. The final weekend will be another double header, this time at Parc y Scarlets. Scarlets will take on Dragons, before Ospreys meet RGC. Even if Ospreys fail to beat RGC, the title should return to Swansea as they have a massive match points advantage over Cardiff, who have now completed their programme.